Pullig has been working in the timber industry for the last 40 years. More recently, he has specialized in clearing the way for oil and gas pipeline projects. He is the president and sole owner of Red Oak Timber Co., a land clearing contractor based in Castor, Louisiana, in the northwest part of the state. Working primarily in a five-state region that consists of Louisiana, Mississippi, Oklahoma, Arkansas and Texas, Pullig’s crews need machines that can perform in a variety of terrains, from rolling hills and grasslands to rocky plains and swamplands. Tracked carrier platforms offer a measure of traction, flotation and low ground pressure that is ideal for most jobsites. The company’s fleet includes tracked feller bunchers, dozers, trackhoes, forwarders and other logging equipment, as well as 12 mulchers ranging from 250 to 600 hp. The newest additions to the stable are two Fecon FTX600s. The Fecon FTX600, along with its brother, the FTX400, is the newest model of tracked carrier from the Lebanon, Ohio-based manufacturer. The FTX600 boasts 600 hp, while the FTX400 offers 400 hp. Both models feature an oscillating track frame undercarriage that controls the machine’s ride over rough terrain. Weighing in at 46,000 lbs without any attachments, the FTX600 has a ground pressure rating of 5.9 psi. The machines are designed with agility, responsive steering and accurately balanced weight distribution in mind to allow the machines to maneuver across rough terrain, over slopes and through the deep woods with maximum stability. In case an operator encounters a difficult situation, the FTX600 winch provides up to 50,000 lbs of line pull to get out of the muck. The component positioning and large service access points on the Fecon units makes servicing the machines easier and cuts downs on maintenance time. The operator cabs also feature an efficient layout for comfort for better production during longer shifts. 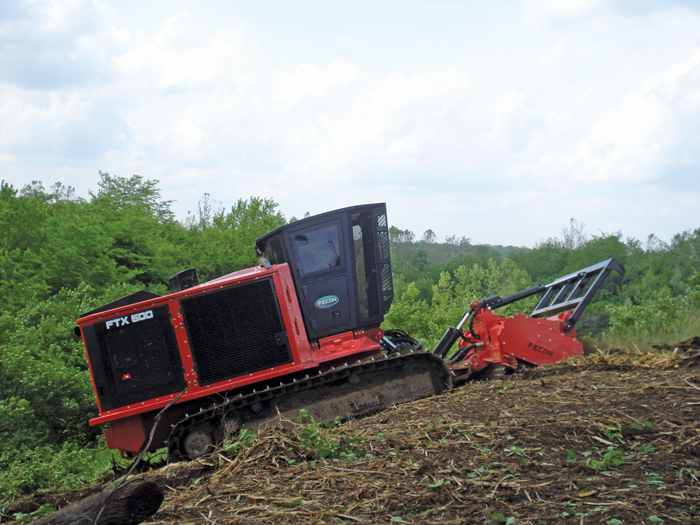 With twin hydraulic circuits, the FTX600 can be outfitted with Fecon’s BH350 Bull Hog mulching head, which is how Pullig and his Red Oak team use the machines. Pullig chose this model because he was looking to tackle more projects. Pullig says he hasn’t had much trouble with his two newest machines. Aside from the usual servicing of fluids and keeping the machine clean, the biggest issue is maintaining the cutting teeth on the mulching head. On one project, Pullig says he spent $40,000 for teeth and teeth holders. It’s just the nature of doing land clearing work. But if you take good care of the machines and keep them serviced and clean, he says, the carriers will continue run well for a long time to come. The FTX600 is the newest track carrier in Fecon’s lineup. 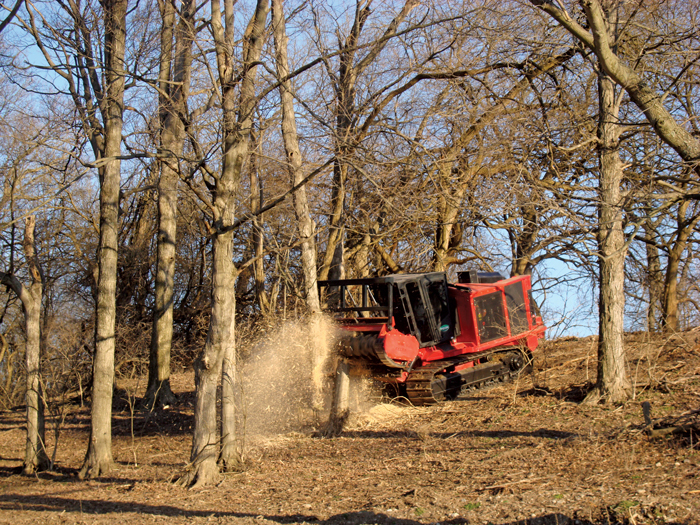 The 600-hp machines can be outfitted with the company’s optional BH350 Bull Hog mulching head for tough land clearing applications. Red Oak’s fleet of mulching units includes some with rubber tires, as opposed to tracked units like the Fecon FTX600s. However, these machines can pose a problem on certain terrains that require more attention to environmental concerns. The tracked carriers provided better traction and less ground disturbance in this case. In the swamps and wetlands in southeastern Louisiana, such as a project Red Oak worked near Lake Pontchartrain, tracked units provide flotation whereas rubber tires would likely get stuck. One area where Pullig has to watch for with his higher horsepower Fecon mulchers is fuel consumption. The best way to get the most from the machines, he says, is to make sure they’re working on the tougher projects. Red Oak employs up to 75 people, directly and indirectly. Oil and gas pipeline projects make up bulk of the company’s business, but Pullig has been known to using his machines to clear land for duck ponds and hunting lanes. When a right of way project calls, though, Red Oak jumps into action. Although Pullig says he has only worked on oil and gas pipelines jobs for the last five years, his 40 years of being “raised up in the timber business” complement his new focus. There’s no set amount of oil and gas projects Red Oak will work on during a given year. It all depends on the length of the right of way. In 2012, for instance, one project took care of the company’s business all year. Some spreads are only a few miles at a time. If it were all the same for Pullig, though, he would prefer the longer projects. Regardless of where an oil and gas pipeline project may take his Red Oak crews, Pullig has a robust fleet of land clearing equipment to handle the job. Whether the company is looking out for an insect’s habitat or avoiding getting stuck in the mud, his new Fecon FTX600 tracked carriers provide heavy-duty mulching power with a light footprint for those challenging terrains.